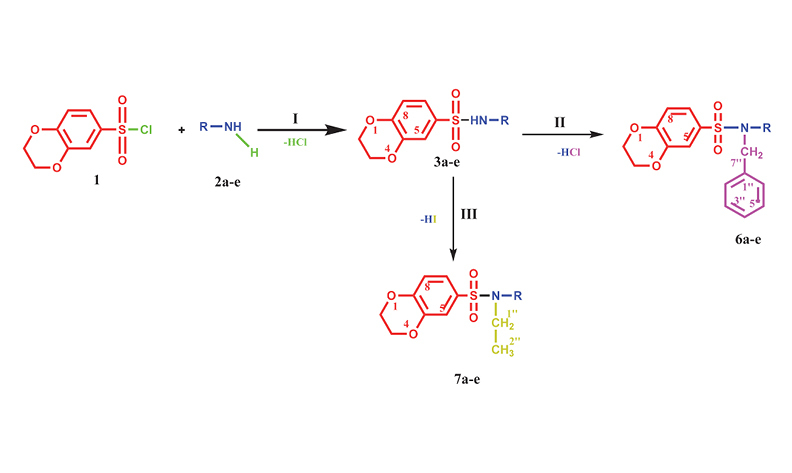 In the current research work we have reported a series of N-aryl-2,3-dihydrobenzo[1,4]dioxine-6-sulfonamides 3 and their N-substituted derivatives 6 and 7, obtained from 3 with benzyl chloride and ethyl iodide, respectively. The synthesis was accomplished as a multistep sequence. The structural confirmations were established by 1H NMR, IR and EIMS spectral techniques. Butyrylcholinesterase (BChE), acetylcholinesterase (AChE) and lipoxygenase (LOX) enzymes were used in this study. It was observed that most of the compounds prepared exhibit a moderate activity against BChE and AChE but promisingly good activity against lipoxygenase. Among the parent sulfonamides 3a, 3b, 3c and 3e showed the proficient antimicrobial activities, while from the derivatives 6a, 6c, 7a, 7b and 7c were found active against the selected panel of bacterial and fungal species. Hemolytic activity was also conducted to check their therapeutic utility. All the compounds were computationally docked against LOX, BChE and AChE enzymes.